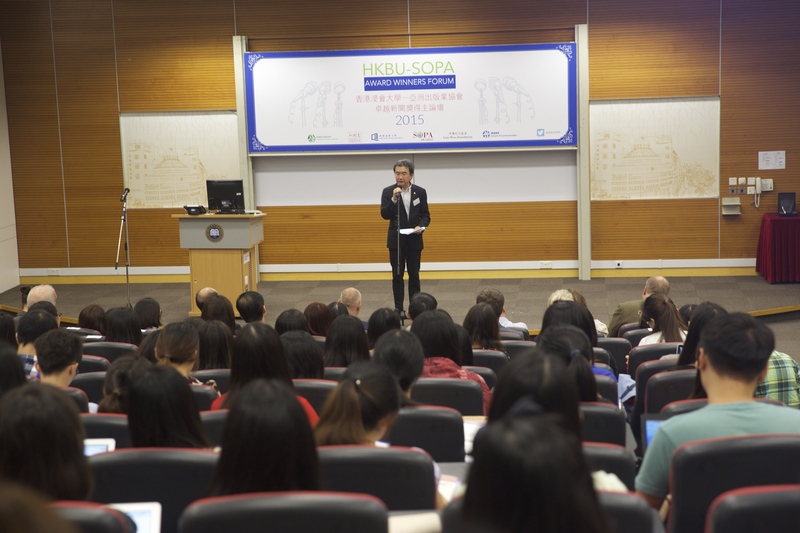 HKBU-SOPA Award Winners Forum is held in HKBU every other years, aiming to enhance the education and practice of journalism in Hong Kong and the Greater China region. This year, the forum is called “Framing a Story: The Journalistic Challenge to Put Issues in Context”. The Society of Publishers in Asia (SOPA), founded in 1982 to champion freedom of the press, is a not-for-profit organization based in Hong Kong and representing international, regional and local media companies across Asia. 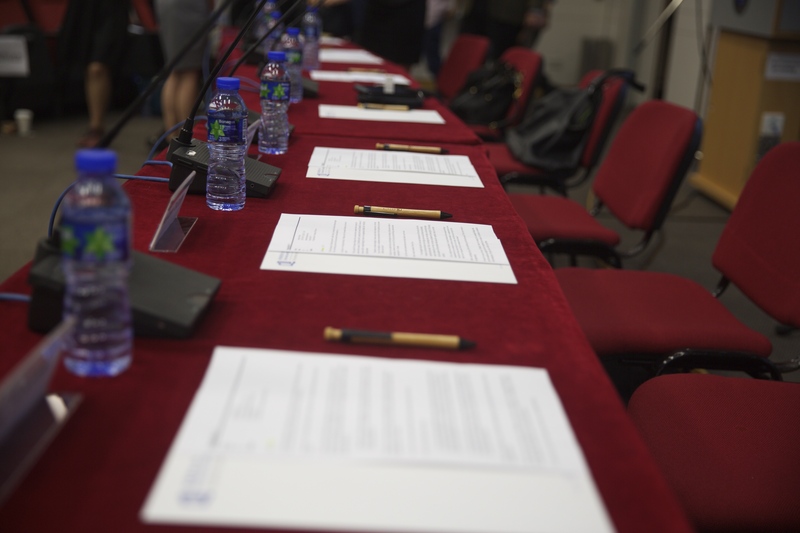 In the forum, a panel of SOPA-award winners are invited to participate in lectures and discussions on the journalism profession. 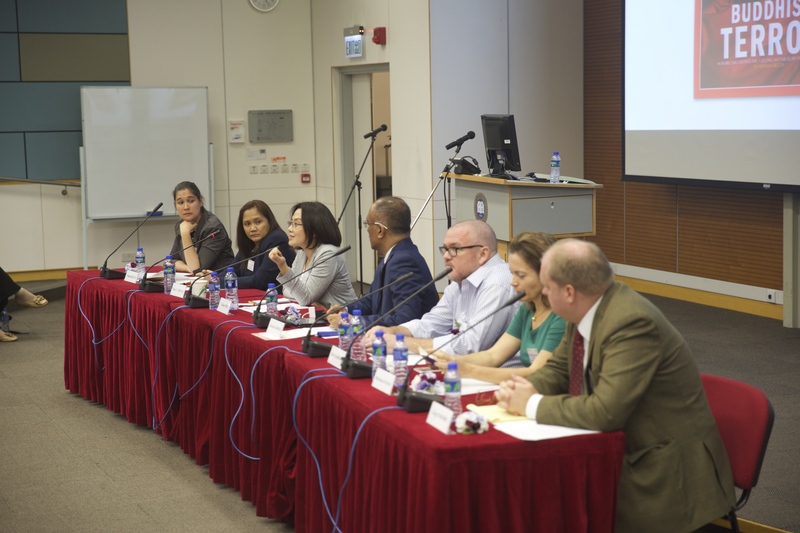 In the opening ceremony and forum of HKBU-SOPA Award Winners Forum 2015 on October 13, six journalists are awarded and invited to take part in the discussion. 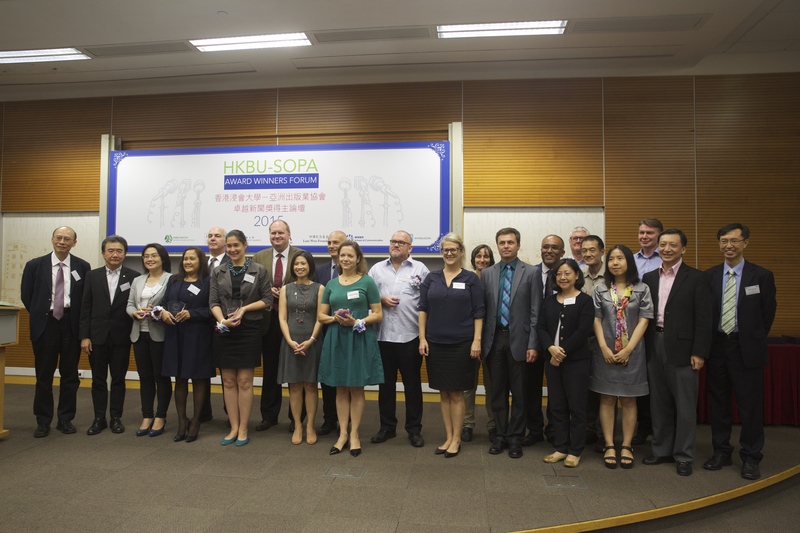 The award-winners in the above picture are Yi-Shan Chen (3rd from left, first line), Nancy C. Carvajal (4th from left, first line), Hannah Beech (5th from left, first line), Didi Kirsten Tatlow (7th from left, first line), Greg Torode (2nd from left, second line) and Harry Harrison (4th from left, second line). Roland T Chin, President and Vice-Chancellor of HKBU, is delivering a welcome speech at the beginning of ceremony. “I don’t know much about journalism,” he says with a sense of humour, and expresses the warm welcome to the distinguished guests. Materials and pens are prepared for the following discussion during the tea break. Both the six award-winners and Dr. Cherian George, an associate professor of the Department of Journalism, will take part and share their opinions about journalism nowadays. Yi-Shan Chen, deputy editor at Taiwan’s CommonWealth magazine, is sharing the progress of the Sunflower Movement. “It is actually an accident,” says Ms Chen. The first group of students who covered the beginning of the movement were actually taking her class and were doing an outside assignment at that time. 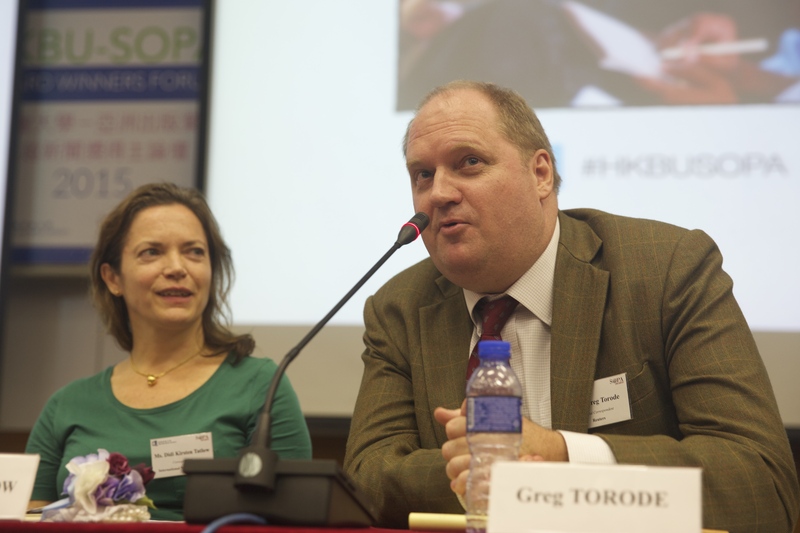 Greg Torode, Reuters’ Special Correspondent, is talking about his working experience as a reporter focusing on politics and security across Asia for the last two decades. “Actually there are so many open resources available, but they are just neglected by most of the journalists,” he said. Henry Wong, a student majoring in International Journalism in HKBU, is taking photos for name tags on a long desk at the forum. 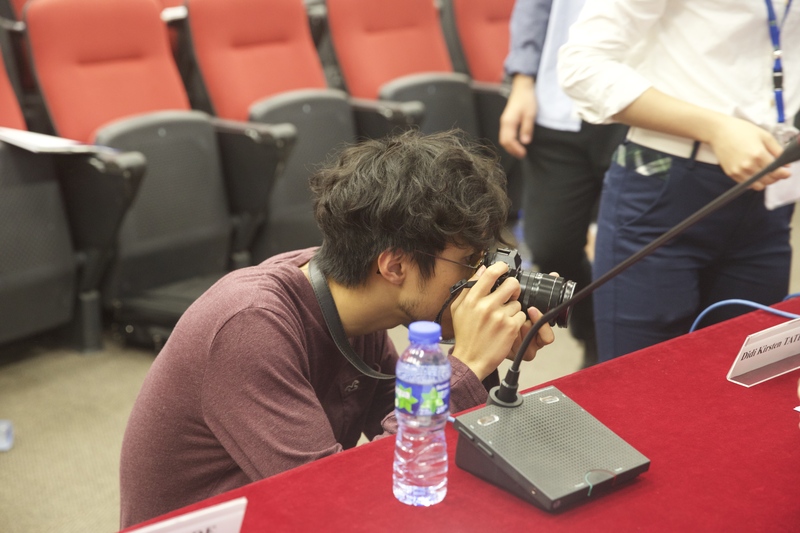 He will use the photos in an event-covering assignment for a course about online journalistic edition and production. 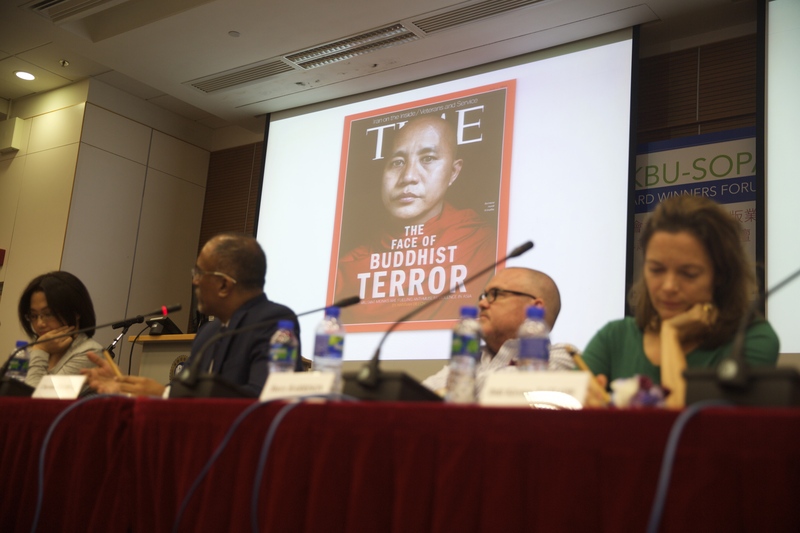 The cover of an edition of Time is showed as Hannah Beech, TIME’s East Asia Bureau Chief and China Bureau Chief based in Shanghai, is talking the story behind her report of Buddhist in Asia. “It is quite controversial,” she says and smiles. WU Qiyao, 20, is a junior majoring in International Journalism at HKBU. She asked Didi Kirsten Tatlow, one of the award-winners, that whether journalists are so powerful compared to lawyers, police, and teachers in current society, regarding the changes they can bring to the society. Above is Ms Wu’s question and guests’ answers. She asked that compared to positions like lawyers and police officers, why should we choose to be journalists. After the forum is ended, some students continue to ask award-winners questions. 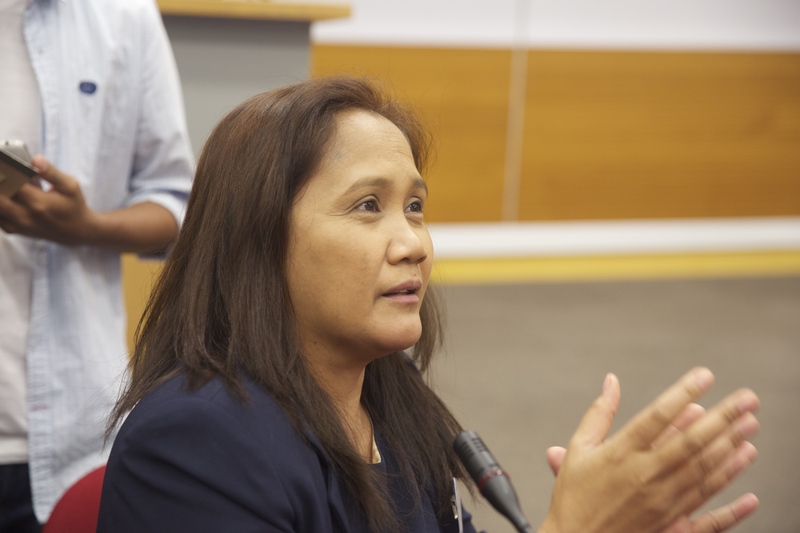 Nancy C. Carvajal has been a reporter for the Philippine Daily Inquirer, the leading newspaper in the Philippines, since 1992. 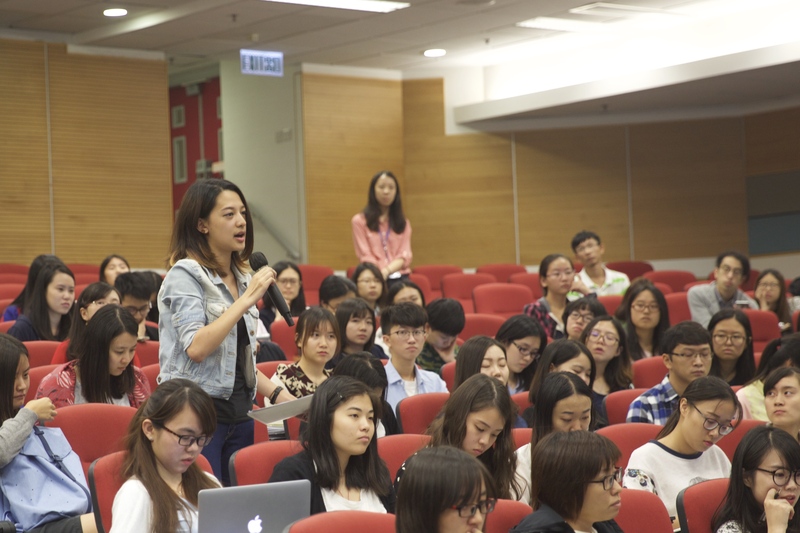 And she is explaining her ideas of the journalists’ role in the society to a postgraduate from HKBU.